Unlike other sprayers that require you to squeeze through or around booms, or to climb narrow steep rung-style ladders, Guardian sprayers provide easy, unrestricted access to the cab. Simply walk up the wide, stair-style ladder to the cab platform. The ladder hydraulically folds up or down when the parking brake is released or engaged. With glass from the roof to the floor, you have a full view of the front wheels, gauges and the crop, and wrap-around rear windows give you fantastic visibility to the rear. The new cab offers more lighting with 16 working lights, as well as larger windows improving visibility. Reliable ACE hydraulic-drive, centrifugal pumps deliver a powerful 100 gallons per minute at the pump for the SP.240R and 160 gallons per minute for the SP.275R. Pumps are mounted below tank level for easy priming. For wide boom widths, choose the outstanding strength and rugged reliability of a truss boom system. The center section of the truss boom features a double pendulum suspension system with nitrogen accumulators to absorb the shock of boom movement. The result is a smooth, consistent boom height and spraying accuracy. The boom rest is now fixed in place, so you are no longer required to slide it in and out. Cummins turbocharged diesel engines power both Guardian Rear Boom Sprayers. These engines are the quietest in the industry for this horsepower range. They provide high torque rise for added power when you need it. For added traction, use the foot-operated differential lock to transfer power to both rear wheels. An on-demand, front wheel assist option is available on the larger 275hp SP.275R Guardian model. 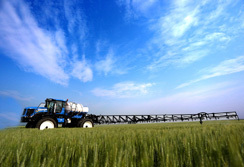 Both Guardian Rear Boom Sprayer models use the same stacked, one-pass cooling package. Instead of modules being layered front to back, they are positioned on top of each other so they all receive the same, cool air flow. The high-volume fan pulls air through the entire system in a single pass, allowing for more efficient flow of cooler air through all of the cores for maximum efficiency. Rugged, heavy-duty Allison automatic transmissions smoothly transfer power through the drivetrain. A locking torque converter maintains constant speed, even in uneven ground conditions. The five-range SP.240R transmission achieves speeds up to 42mph, while the SP.275R travels up to 40.6mph. A cruise control switch on the armrest console allows you to return to a pre-set speed with the push of a button. A crop clearance up to 48 inches allows you to perform. The structural steel front axle features massive 2.5 inch kingpins and bushings. A full 11 inches of suspension travel provides for a very smooth ride. The rear axle features a heavy-duty design with formed steel receiver tubes to handle harsh ground conditions. The active suspension system uses four air bags, gas shock absorbers, trailing arms and a large-diameter anti-sway torsion bar to keep the boom parallel to the ground. This system maintains a constant height and smooth ride. Heavy-duty, cast-iron drop boxes provide 48 inches of crop clearance and are standard on the SP.275R and optional on the SP.240R. A 42-inch clearance angle drive shaft is standard equipment on the SP.240R. New Holland Sprayers are designed for easy routine maintenance with components and fill points that are easy to reach. The shock-assist Guardian hood is easy to open and hinges forward for complete engine access. Hydraulic reservoir is located in front of the cooling package, directly above the pump, resulting in short hose length and unrestricted oil flow. The approach to the walkway is now from the front of the sprayer, making it easier to access. This makes it more convenient to check engine fluids, clean the windshield, and access the cab door. A convenient ground-level fill control station is located on the left side of the sprayer, along with remote battery terminals, remote pump switch and control valves. A stainless steel chemical fill hopper lowers for easy filling and lifts back up to storage position with spring assistance. Next to the fill station is a large, built-in, lockable storage compartment for convenient storage of tools and safety gear. The 120-gallon fuel tank allows you to spend a full day without refueling. It is located on the right side and provides easy, ground-level fueling. • On-demand front wheel assist (SP.275R) provides more traction “on the fly” when you encounter soft or muddy field conditions. • Hydraulic alxe adjustment gives you the flexibility to easily adjust tread width from 120 to 150 inches from inside the cab. • Raven Ultraglide® or PowerGlide® Plus boom height control systems maintain optimum boom height. • Pace high pressure washer with hose reel allows for convenient rinsing and cleaning. • The auxiliary lighting option offers HID lights replacing halogen lights on the upper roof panel. The auxiliary package will have 4 HID lights and 13 halogen lights, totaling 17 work lights. • Boom blowout and drain kits allow you to fully clean the boom valves and lines.